This is a guest post by Giovanna Scott, from www.giovannascott.com. Having a child with Special Needs can be harrowing. Keeping track of the test results, reports and documentation for all the government departments is equally so. I thought I could manage it all until I was stuck one day at my son’s Occupational Therapist. I had used up one lot of funding but hadn’t presented them with the paperwork for the other pool of funding which was in another folder. Because of this, I had to pay the full amount . I was always proud of being a super-organised and efficient Mum-Therapist. But it all fell apart this day and I knew I needed help. 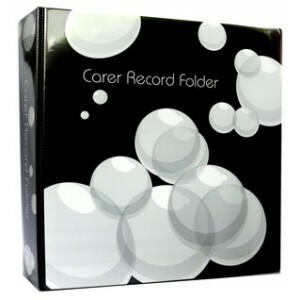 Although I’d heard of the Carer Record Folder I was convinced that my record keeping method was fool-proof. Fool me! Overcome with relief when the folder arrived, I got straight to work sorting out my paper mess. Chrissy McDougall of Spikko has done a fantastic job creating relevant headings. Some include: Education (great for keeping track of IEPs and Interview Notes), Centrelink, Therapies and Medical. I’ve even created my own sub-divisions within certain sections. The folder comes with a CD containing blank templates of all the forms in each section so the information can be entered electronically and updated as needed. The beauty lies in the speed at which you can locate things. When it’s tax time, you simply grab all the paperwork filed under “Receipts/Statements” for that financial year and lodge them. Easy!!!! You could even separate the receipts according to type. The possibilities for customizing are endless. When the time comes to try new therapies for my son, I grab my Carer Record Folder because it has all the information and history in ONE SPOT!!! There will never be a need to rummage through piles of paperwork or wondering where I’d filed that Assessment, ever again! Although the Folder has been designed with Special Needs children in mind, it can easily be modified for any child. Think of kids with special dietary needs or a medical condition (such as asthma) that needs special management. The Folder now comes in an Adult version, alleviating the stress of managing your own condition or a relative’s. “Do yourself a favour”, order one for yourself and a friend. It is the best gift you can give. Giovanna Scott – Super-Mum to Mackinley (10) and Rainer (8) who has severe Autism. This post was written by a guest contributor. If you are interested in ‘being my guest’ please visit Be my Guest page for more details. Thanks for that, I have just bought one! I am forever digging up medical results and really need to keep it altogether. Awesome! I made my own home made version of this when Heidi was diagnosed with Autism many years ago. Great to see an easier solution as we have so much on our plates – especially in the early days when everything is such a steep learning curve, that being able to get a ready made folder is brilliant. The best bit of advice I ever got when Heidi was first diagnosed was to keep all your paperwork, make sure communication was in writing so you could refer back to your notes later. So vital, especially when you have a disagreement about what was actually said later on. That’s a fabulous idea G! The stress of caring for a special needs child shouldn’t be made more difficult by damned paper work. I’m so glad that this system is making your life a little easier. Thanks for sharing. My special needs sons are 4 and 8. I wish I had heard of these folders earlier! My paperwork is in piles around the house, so I'm off to check them out now. Thanks so much for sharing! This is an awesome idea and I wish I had had this at my fingertips last year when we were wading our way through the endless stressful autism assessment process. I now look at the crammed plastic sleeve where I have kept all the endless reports, forms, appointment cards, receipts, contacts etc and wonder how we ever got through it all. You are to be applauded for such a wonderful tool which will no doubt help all those stressed out mums/dad's out there going through such situations. Well Done. As a therapist, I can say that this is a FABULOUS idea! We tend to give parents so many pieces of paper (together with all the other therapists and agencies that you are seeing) that I often wonder that you don't need to bring along a filing cabinet on wheels to each session! Yay you for making parents lives easier! I got given one of these from my support person the first day I met them. I love it . It means I always have what I need for my child no matter where we go. What a great idea! I totally need one of these! Wow! This looks fab. I have a folder for each of my boys, but they’re a bit small and starting to overload. I recently bought 2 of these ( 2 kids) and for the first time in 13years I feel truly organised with their medical and school paper work.